Sheriff had the most liked content! What are your pet peeves at the gaming table? i pick up hits eg if its 5s/6s only from a bucket of 60 dice, but i ask the opponent first and be sure to do it very visibly / not too fast like a magician. I've not found anything that game-changing for grots but have had success with these 2. Gitmob shaman on wolf with the Crown of Treachery. He legs it really far and then vaporizes hordes, or can wait behind a line of grot-bait and activate it in the enemy turn to squish a hordey unit. Great when attacking alongside wolf riders too, makes a nasty battleshock. His movement is the key thing, he can get to a fairly safe position to activate this thing, and move far enough to make it feasible in the first place. Fungoid with Alchemical chain. You can re-roll unbinds with this guy once per game until your next hero phase, and given that we always have to take first turn (GW won't let us have a say in this) you can activate it turn 1 and then unbind 2 spells with re-rolls, including through enemy double turn. He's always near the front of the army anyway for his command, so perfect for unbinds. Otherwise I plan to try this next: arachnarok with defensive-cogs and ethereal. Triple caster anvil-missile that the enemy can't ignore if realm spells are in play, that saves 75% of normal attacks. (or you can give him the feather and plonk him behind a wall of netters for a tasty -2 to be hit). Been working on a troll list as a side project for a while. its led by a megaboss for bellowing tyrant / bravery 8 fellwater trolls. 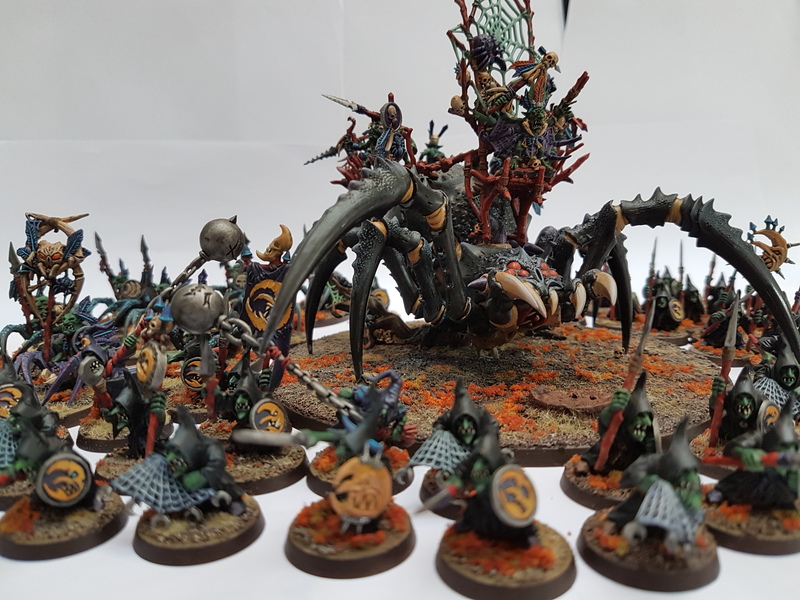 ethereal arachnarok with cogs as a tanky spellcaster in the realms, 2 grots blobs for net-guarding the trolls, 2x3 troll units as well inside the grot blobs. fanatics too. best thing about this is it filters out the stupid soft scores from the various tournaments. Don't over-think it. Its a mushroom capable of thought and movement, just like a grot. The rock is like a little rogue idol i guess. On the new maps the threat range doesnt need to be so long (18 instead of 24 inch), and you can get that by other means than fungoid (cogs, destruction move, realm spells, Gordrakk, etc.). Personally I tend to just sit on objectives rather than charge to enemy anyway. Bellowing Tyrant if using fungoid general, because it gives +2 threat range to the unit the buff is put on, with command ability. If using a spider hero then I still like Bellowing Tyrant just for the +2 bravery buff on spider riders. Have tried yes, and 60 is way better for many reasons, and actually wins you games as a result. With 3x60 you can dominate objectives for 3 turns, which often wins you the game, then you have like 600 points to fill with your favourite monsters.